While SharePoint is a great piece of software, learn why it makes for a bad choice for most organizations that are in the market for a knowledge base tool. There’s no denying that choosing knowledge base software isn’t exactly an easy task. With so many solutions to choose from, it can be difficult to narrow down which one is the best fit for your organizations needs (not to mention your customers’ needs, as well). More importantly, you need to be sure that your knowledge base software of choice actually provides value to your customers, and enhances their experience with your brand. Now, if you’ve been looking for a knowledge base solution for even a short period of time, you’ve probably at least considered checking out Microsoft SharePoint. After all, it’s generated a number of overall positive reviews on reputable sites like Capterra and Software Advice. However, while SharePoint certainly is a quality piece of software, it’s not for everyone. In fact, we’d argue that SharePoint isn’t for most organizations that are in the market for a knowledge base tool. Throughout this article, we’ll discuss the main reasons SharePoint might not be your best option when choosing a knowledge base solution. As we said, SharePoint falls short as a knowledge base solution in a number of ways. To add to these, there’s also one major, forehead-slapping reason that SharePoint might not be your best bet as far knowledge base software goes. We’ll get to that toward the end of this article – but you’ll probably have figured it out by then, anyway. Earlier, we alluded to the fact that most organizations probably aren’t a perfect match for Microsoft SharePoint. What we mean, here, is that SharePoint caters to an incredibly focused customer base. This isn’t necessarily a bad thing; after all, if your organization fits into this niche, you actually stand to get a ton of value out of the tool. However, if your organization doesn’t fall into this narrow target audience, you’ll likely find SharePoint to either be overwhelming or underwhelming – and altogether not very useful. This is perhaps the most prominent complaint users have when assessing SharePoint as a knowledge base software. Basically, if you’re looking for a knowledge base software that your team can quickly pick up and run with, SharePoint probably isn’t for you unless you’re already a SharePoint power user. First of all, one of SharePoint’s main selling points is that it allows for in-depth customization in terms of interface and creation of databases. The problem, here, is that such customization is essentially required from the get-go; that is, you’ll need to configure SharePoint’s interface before you even get started using it. For individuals with little to no technical knowledge, this can prove to be an overwhelming – if not impossible – task. Even if your team does have the technical ability to use SharePoint, there’s still the issue of deciding which option or pathway is best when configuring and developing your knowledge base. While having a variety of options might seem like a benefit on the surface, it can lead to major analysis paralysis amongst your team – ultimately leading to a halt in productivity at times. All this being said, to get the most out of SharePoint, your team members need to not only have a high level of technical knowledge, but also must be able to build “something out of nothing” with absolute confidence in the decisions they make. The fact that Microsoft offers both a cloud-based and on-premise version of SharePoint may seem like a major “plus,” but there’s a pretty big problem, here. As many Capterra users point out, the cloud-based version of SharePoint is quite lacking in terms of features and functionality. Unfortunately, there seems to be no middle ground, here; as overwhelming as the on-premise version of the tool may be, the cloud-based version is equally underwhelming. Aside from the obvious problem here (that the cloud-based version might be a bit too simple, even for smaller organizations), this issue is worsened by the fact that most organizations will eventually need to upgrade to the on-premise version at some point. This equates to an initially unanticipated investment of time, money, and other resources as said organization works to install the on-premise version on the applicable devices, and to onboard its team with the more advanced tool. Helpjuice is definitely the better option, here. Your team won’t need to spend much time getting acclimated to Helpjuice’s interface – and you definitely won’t need to do any heavy lifting in terms of initial configuration and customization, either. As shown above, none of this requires much technical knowledge at all. If you can use Google Docs, Helpjuice will be a cinch; it’s that simple. With Helpjuice, users also receive in-depth support documentation, along with access to our support team, as well. So, even if you do hit a roadblock while using Helpjuice’s software, you’ll easily be able to figure out how to overcome it in no time. Now, even if we assume that your team is technically able to use SharePoint to its highest capacity, that doesn’t necessarily mean you’ll be able to do so. That is, many users report that SharePoint is rather lacking in terms of functionality. A common complaint among Capterra reviews is that SharePoint is often slow to load, while at the same time taking up a large amount of bandwidth. Needless to say, for smaller companies who may be stretching their bandwidth already, this could cause some major issues (both internally and for their customers). Another user explains that SharePoint’s online editing system “seems to overwrite changes that other users are doing at the same time.” While multiple users can access and edit documents within SharePoint, it seems that doing so in real-time may end up causing problems for the entire team. One final technical issue worth mentioning is that many users report having difficulty when updating SharePoint’s software from older versions. While this might not seem like a problem to those who haven’t used SharePoint up until now (that is, those reading this at the current moment), the potential is certainly there for such problems to occur as updates are rolled out in the future. Now, along with these issues related to functionality, SharePoint is also rather difficult to navigate from the perspective of the customer. This issue unfortunately rears its ugly head in two different ways. Firstly, SharePoint’s ability to index text is, to be blunt, quite lacking. Text within files (such as PDFs, PowerPoints, etc.) is completely unfindable via search. To make matters worse, even when text is uploaded directly to a wiki page, SharePoint’s search function only reads the metadata for said page. Unfortunately, this means customers will essentially need to comb through your knowledge base to find what they’re looking for (or happen to use the exact phrase used within your metadata for a specific page). Secondly, SharePoint’s Information Architecture is severely lacking, as well. Going along with everything we just said, there’s little to no sense of context surrounding documents within your SharePoint database. In other words, data and documents are presented as if in a vacuum, without any sort of understanding by the software of what the data actually “means.” So, again, unless your customers happen to stumble across the exact information they’re looking for, it’s rather difficult for them to get what they need from your knowledge base in SharePoint. In terms of navigability, Helpjuice again has SharePoint beat. Since documents can be easily categorized in a logical manner, customers can just as easily find the information they’re looking for simply by perusing your knowledge base on their own. Additionally, Helpjuice’s editor allows collaborators to quickly and easily work on documents simultaneously, while also ensuring remote collaborators don’t unintentionally erase each other’s work. 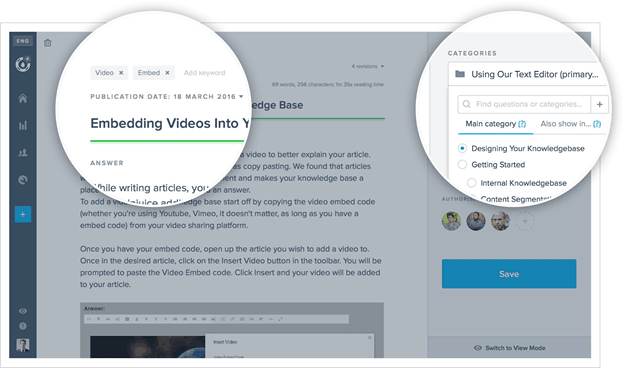 Collaborators and editors can also easily link to other articles within a knowledge base with only a few mouse clicks – in turn pointing customers to further resources as needed. Helpjuice also includes powerful Intelligent Instant Search functionality. In similar fashion to Google’s suggested search capability, Intelligent Instant Search recommends documents and pages to searchers in real-time as they type up their query. As we alluded to earlier, Helpjuice uses a combination of categories/tags and machine learning to provide relevant and contextual search results. Needless to say, this is incredibly convenient, as it allows customers to quickly find the exact information they’re looking for – as well as supplemental information that they’ll find valuable, as well. Furthermore, Helpjuice provides powerful analytics, allowing users to see what search terms customers are using, what articles/documents are being read, and where there appears to be gaps in knowledge within certain audience segments. 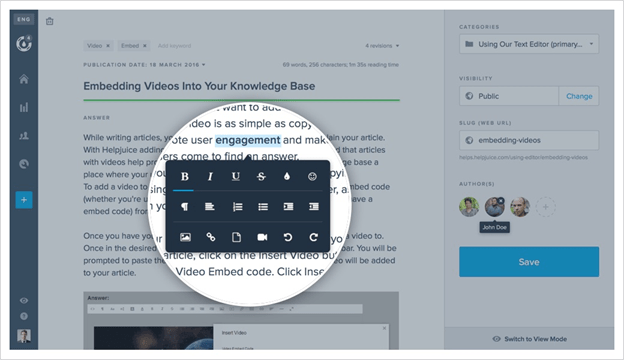 This in turn allows organizations to focus on creating more in-depth content regarding specific topics as needed. As we’ll dig into a bit more later on, a knowledge base isn’t meant to simply present information; it should also make such information easy to find. With Helpjuice, your customers will always be able to find what they need without having to comb through a sea of irrelevant content. However, the “per user” price can easily add up, and end up costing even relatively smaller organizations much more than they had initially anticipated. SharePoint is meant to be used in some way by pretty much every member of a company. Some teams may use SharePoint internally, as a way to create and share company-facing documents and data. Others will be in charge of creating customer-facing documents for the organization’s knowledge base. Still others will use it for a combination of both. Additionally, each of these teams or users will utilize different features and functions of SharePoint. Looking at this another way, not every team or user will use every single feature or function available at a given tier. Still, the organization will need to pay for the same tier across the board, even if some users technically could get by with using the lower-tiered version. Going along with this, it’s also worth mentioning that there’s a rather drastic difference between each of SharePoint’s pricing tiers. This may mean an organization will need to upgrade to a higher tier of the software in order to receive certain features – even if the team doesn’t plan on using many of the other additional features included in the higher tier. Again, this potentially equates to a massive waste of monetary resources over time. While SharePoint allows for unlimited users at each tier (at a flat per-user price), Helpjuice caps the amount of users for its Business and Scale tiers. After doing the math, you’ll find that the price per user for the Business tier is $6.63 per month, while the Scale pricing comes out to $4.15 per user per month. Obviously, the Business tier does end up being more costly than SharePoint’s lowest tier; we’ll address that in a moment. Additionally, as shown above, Helpjuice works with its Enterprise-level customers to determine a fair price-per-user depending on the organization’s size and needs. Again, this minimizes instances in which companies end up paying for features they won’t necessarily use. Also, as we’ll be addressing in the next section, Helpjuice is strictly a knowledge base software that is mainly meant for use by customer-facing teams within an organization. In contrast to SharePoint, Helpjuice is typically not meant to be used by everyone within a company. That said, companies opting for the Enterprise version of the software will only need to consider those who will actually use the software when negotiating a fair price. SharePoint is more of a knowledge management software than a dedicated knowledge base tool. Basically, SharePoint is really meant to be used as a data repository, through which organizations can create, store, and share information. Again, while this data and information can be made public to an organization’s customers, it’s usually done so in a rather “bare bones” way that’s not exactly user-friendly. Now, this isn’t to say that SharePoint isn’t great at what it does; it’s supposed to be focused more on data and knowledge management. However, as we’ll discuss momentarily, a knowledge base is meant to do a bit more than that. In comparison, Helpjuice is a dedicated knowledge base software. The essence of a knowledge base is that it’s not simply focused on storing and presenting data – it’s meant to help individuals use this information to solve specific problems they may be facing. As we said earlier, SharePoint (and other knowledge management solutions) are used to store data with little to no regard for context. On the other hand, knowledge bases put this information into context, in terms of what it all actually means to the individual searching for it. Think of it this way: knowledge management platforms are like libraries in that they definitely have the information an individual is seeking; knowledge base platforms also act as librarians, pointing the individual to the exact information they need to move forward. That said, if your goal is to find a tool that will enable you to keep your customers informed and engaged with your brand, Helpjuice will prove much more valuable to your team than a knowledge management tool like SharePoint. To learn more about how Helpjuice can help you create a knowledge base for your customers, check out our Features page. If you’re ready to get started using Helpjuice, you can begin creating your first knowledge base right away.